AWSMP will be attend­ing this year’s Olive Day on Sep­tem­ber 8 from 9:00 am to 5:00 pm at the Lester Daivs Park located at 686 Wat­son Hol­low Road in West Shokan, NY (right next door to the Olive Town Hall). Olive Day is an annual event that cel­e­brates all the things that make the Town of Olive a spe­cial place to live. There will be food, live music, a vari­ety of ven­dors, local and regional orga­ni­za­tions with edu­ca­tional dis­plays, and activ­i­ties for chil­dren and fam­i­lies includ­ing the always pop­u­lar frog race! AWSMP will have a table with pro­gram lit­er­a­ture as well as an edu­ca­tional dis­play. We will also be bring­ing our stream table. 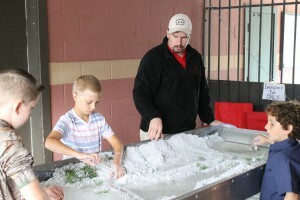 The stream table shows how water inter­acts with and shapes the land­scape around it. It also shows how human inter­ven­tion in streams can change how water flows and the shape and depth of the stream. Stop on by to see the stream table in action, pick up some lit­er­a­ture and say hi. We look for­ward to see­ing you at this year’s Olive Day! AWSMP Youth Edu­ca­tor Matt Savatgy uses the stream table to show youth how manip­u­la­tion of the stream chan­nel can cause changes in the sur­round­ing land­scape dur­ing Olive Day 2017.